There are a lot of new-fangled mechanics that have come to popularity in the recent years: worker placement, deck building, and dice building to name a few. But other mechanics have a much longer history. Among game components that have a rich history dice and cards both trace back over 1000 years. In this mechanic guide we’ll explore the most common implementation of card driven games, Hand Management. Hand Management: How Does It Work? Hand Management pre-dates modern board gaming and has gained widespread exposure through various traditional card games such as Hearts, Euchre, Cribbage, and Bridge. The key aspect here is providing players with a hand of cards (or tiles) from which they can play throughout the game in a meaningful way. Generally the decision at hand is when and what order to play the cards in. There is often an emphasis on the interaction between cards with each other and the current game state. Some cards will be more useful if played in combination or in sequence with each other including those that the other players have played. One of the simplest implementation of Hand Management is found in traditional card games which, as a result, are very accessible and popular. Players are dealt a hand of cards at the start of each round and then play one or more cards in turn order until the hands are depleted. The cards only interact with the other cards played that turn and generally have a single use such as relative power when determining who wins a trick. Concepts like trump are a good example of how the utility of a card may change from round to round. Along those lines, card counting is a good example of how being aware of the game state (what has been played) will alter the relative usefulness of a card. Modern board games have added many twists on this formula to provide more complicated and interesting options. For instance, cards may be played in a variety of ways to give a wider range of choices. In addition to determining when to play the cards, how to play them must now be considered. 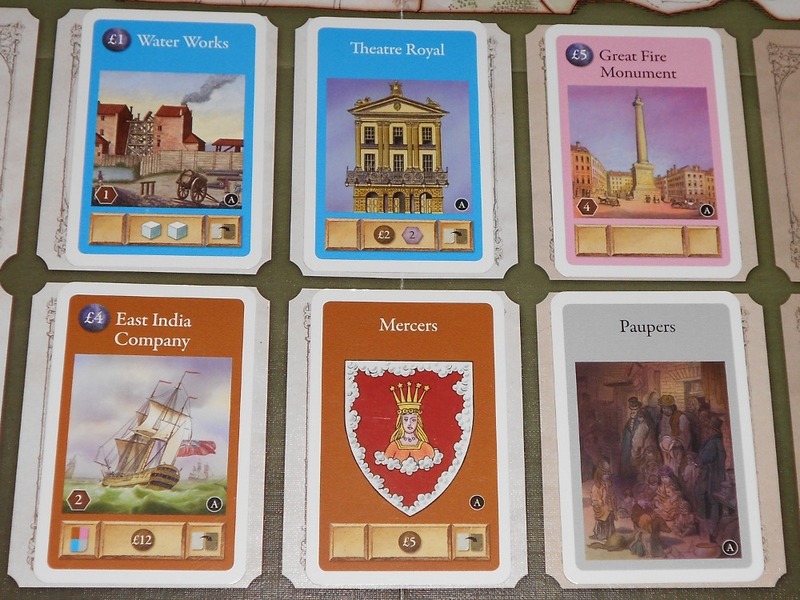 Cards can represent resources that are gained throughout the game or actions that become available as the game progresses. In this way the optimal way to play cards may change based on what is currently available or, given a hidden deck of cards, what could become available in the future. San Juan took the concept of cards as a resource to a whole new level. Cards had many different functions depending on how they were used. They could be buildings that were brought into play, the currency that is used to pay for buildings, and the goods produced by buildings. Glory To Rome further expanded on this model allowing cards to also act as actions, buildings, resources, and patrons. The rise of the CCG and later the LCG shifted the focus from a single deck of cards from which hands could be populated to a personally crafted deck. Each player could incorporate their favorite cards and tailor a deck to meet their own play style. In recent times Deck Building has taken the concept of Hand Management and shifted the emphasis to managing not just a hand but also a personal deck of cards. This newest iteration of the mechanic allows players to dynamically affect how their hand is populated and can be read about in great detail here. Unlike some more obscure mechanics, Hand Management is widely known and loved by gamers and non-gamers alike. The hunt for the perfect gateway game is far less critical with games that emphasize Hand Management because most of your non-gamer friends will have a favorite traditional card game that they know well. This isn’t to say that you can throw people into the deep end and teach them Race For The Galaxy with no problems. The advantage is that most people are familiar with the concepts utilized in Hand Management, namely playing cards from your hand in an optimal order. Cards provide a great way for players to maintain hidden information during a game. With a hand of cards each player can choose how they are going to reveal information throughout the game. Clever card play isn’t just about playing useful cards at the right time but also about withholding information that could provide an advantage. The number of cards and what percentage of them are used in a given game can have a drastic affect on how difficult it is to determine what the other players are holding. This can used to make it more or less important to track what has been played and what cards as still remaining. Cards often give players some beautiful artwork to look at when it’s not their turn! Because of the reactive nature of card play and prevalence of hidden information, Hand Management lends itself well to tactical play. The timing of how you play out your hand in reaction to the other players and state game is generally a critical component to the strategy needed to succeed. As is such, many of the benefits of tactical-centric games are present within the Hand Management mechanic. Since the game state changes often games tend to be dynamic in nature and encourage players to pursue strategies based on available cards rather than a predetermined route. Players are generally playing with limited information and with most this can make decision making less overwhelming. Depending on the nature of how cards are distributed throughout the game, Hand Management games tend to have good variation and replayability. The hidden nature of cards keeps the game state at the beginning very open and each game unfolds differently as the players react to card play. 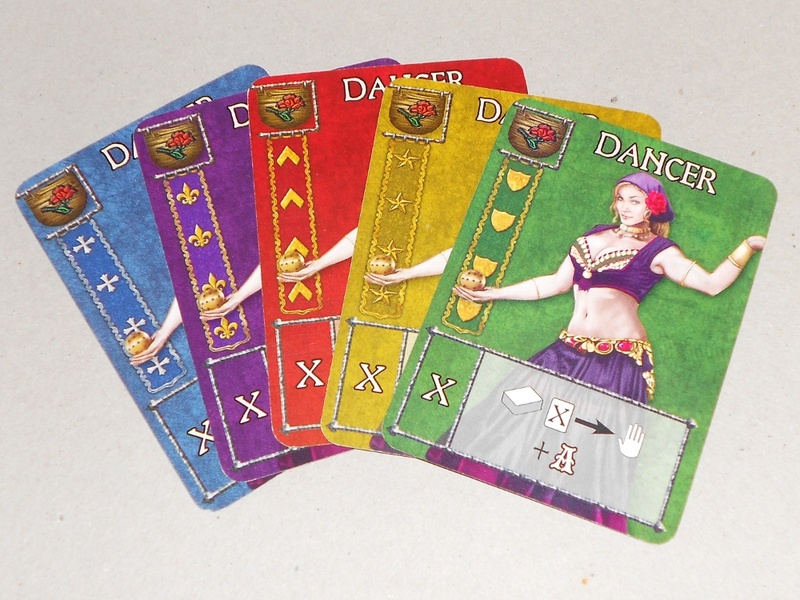 Each card, in essence, represents a choice or action that the player can take during the game. Having a hand of cards in front of you to remind you of your options can easily help visualize what actions are available. Cards often have text or symbols that quickly present and summarizes these options making card play an intuitive part of the game. Cards are very helpful for driving the action in a game but can create a number of barriers for entry into a game. Generally it’s not hard to teach how cards drive the action in a game but a large variety of cards can present difficulties to teaching. Most players don’t want to go through an explanation of what every card does so either a player aid or teaching the general categories of cards can be a good start. The last thing you want to do is pause the game every couple of minutes to explain what a card does to a new player or pass around the reference sheet but sometimes it’s better than explaining every detail up front. Once you get through a game or two this problem tends to go away but it can be discouraging for players that are used to a simple deck of cards.Hidden information has the affect of limiting what a player knows about the game state and makes complicated calculations less common. However, the opposite can be the case for some players that like to take all possibilities into account. The shear combination of how the cards from a player’s hands can interact with a fluctuating game state often makes optimization impossible. This can be quite frustrating to a player that likes making calculated decisions and can make the game grind to a halt as the iterate through all the different card plays in their head. 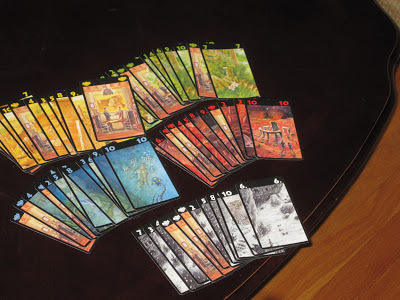 Cards generally represent a random element and the presence of distributing opening hands and card draw throughout the game can create a large randomization factor. In some cases this can be a great thing if the relative power of cards is pretty even but often that is not the case due to the situational strengths inherent in the system. Having an opponent get a lucky draw or opening hand can be frustrating and in some cases determine the winner. Race For The Galaxy: Race creates tense decisions by making players determine which cards in their hand are worth using to pay for the cards that they want to bring into play. At some point during the game you’ll have to give up something you want for something you want more. Jaipur: Jaipur has players drawing from a shared pool of cards that represent goods that they are racing to sell quicker and in larger quantities. The opportunity cost of taking cards is that your opponent will get first crack at the new cards that show up. A hand size limitation forces players to carefully manage the timing in which they acquire and sell cards. GOSU: Players are competing to construct an army of Goblins in GOSU but your troops (the cards) are a scarce resource so they must be played with care. Properly managing not only how you play your cards but also how you are going to gain them and make your opponent discard them is key. Hanabi: Hanabi is a cooperative game in which players have to play five suits in ascending order without knowing the cards in their own hands. Players have to manage not only their hands but also the information at the table. Clue tokens are precious, and the game is tense as time runs out. This game is excellent.Lost Cities: Dr. Knizia inverts the order of the draw 1/play 1 gaming trope to create a tense game of two-player hand management. Players have knowledge of their hands, their opponent’s played cards, and the discard piles, and based on this information they must take risks to play for the most valuable expeditions. This game is one of the best for two players. Arctic Scavengers: Arctic Scavengers is a deck-building game in the vein of Dominion. Unlike Dominion, however, hands have many different ways to play out since most cards can be played in multiple ways. Players must budget which cards will be used for gathering resources or drawing and which cards will be used in a blind bid for the powerful cards available in the skirmish. *Note: Due to the overwhelming quantity of games that utilize hand management this timeline is intended to spotlight ones that emphasis or uniquely use the mechanic. Do you have a favorite Hand Management game that didn’t make it on to the timeline? Are there any aspects that you love or drive you crazy? Leave some comments below! I love hand management! I’d like to humbly present Koi Pond as a my own attempt at spinning the hand management mechanic. In the game, you collect cards in various suits and quantities of those suits. They’re kept in your hand, in a public tableau, or discarded to a personal discard pile. Each turn, you get three new cards and from amongst all the cards in hand, you choose one to add to your tableau, one to discard and one to keep. After each round, you compare the total of a suit in your hand and the total of that suit in your tableau. You score points for each suit equal to the *lower* total. So if you have five Blue in your hand but only one Blue in your tableau, you only score one point from Blues. Basically, you’re trying to keep the hand and tableau as balanced as possible to maximize your score. Alright, enough plugging of my stuff. I also recommend a little game called Biblios, wherein you keep cards in anticipation of a future auction. However, the cards you keep will *not* be in the auction. So, do you want the bidding power or the actual item? It’s a tense decision! Thanks for telling us about your game! It sounds interesting, and after I watched the video for it, it looks like it corrects a problem my wife had with Biblios, that she felt too much in the dark to make good decisions. Yeah there is something about cards and hand management that is so flexible, interconnected and full of design variation possibilities. The whole dynamic of what to play when based on what limited info you know of what others have played or might play is the main thing I enjoy. Hey there. I just wanted to give thumbs up for the article, on which i stumbled upon by coincidence.